The replacement version of the 1998 Flair Showcase Legacy Collection Roberto Alomar card was purchased on January 5, 2017. After 17 different tick marks on the tracking record, it finally arrived on February 9, 2017. It was stuck somewhere for 30 days. I had to report this as missing twice to the Post Office. Only after the second attempt was the tracking record updated. I'm glad I finally received this card because I've been itching to blog about it for a while. While I'm putting this in the Errors category, this isn't technically an error; it's a replacement. However, this isn't a typical replacement card commonly procured via an attempt to replace a damaged card. This was an actual pack-issued replacement. The replacement process happened during the manufacturing and development phase of production. The foil text color on typical 1998 Flair Showcase Legacy Collection parallels is blue (shown on the left). In contrast, the foil color on typical 1998 Flair Showcase Masterpiece parallels is purple (shown on the right). 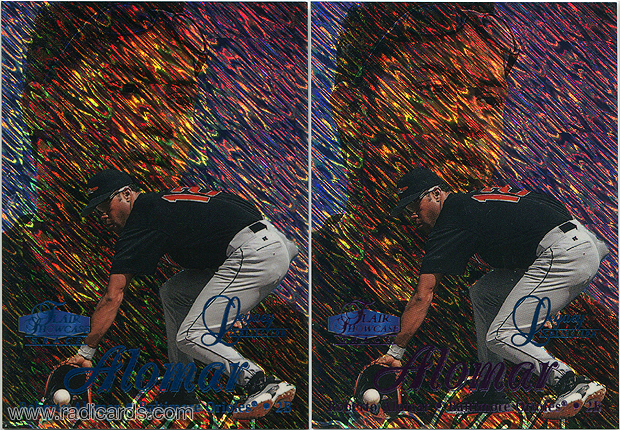 The example of the Roberto Alomar 1998 Flair Showcase Row 1 Legacy Collection shown on the right has a combination of blue and purple foil text color. The Legacy Collection logo is printed in standard blue foil text while Alomar and the Flair Showcase logo is printed in purple foil text. A few sheets of 1998 Flair Showcase Legacy Collection parallels were backdoored. A run of Row 0 parallels have surfaced featuring unique serial numbers but marketed as promos on the secondary market. These are commonly considered 'aftermarket' examples. Because those sheets were missing from the total required to print the the full run of Legacy Collections, Flair used remaining Masterpiece sheets and stamped them with the Legacy Collection logos and respective serial numbers. These are quite a bit rarer than the standard issued full blue foil text Legacy Collection examples. 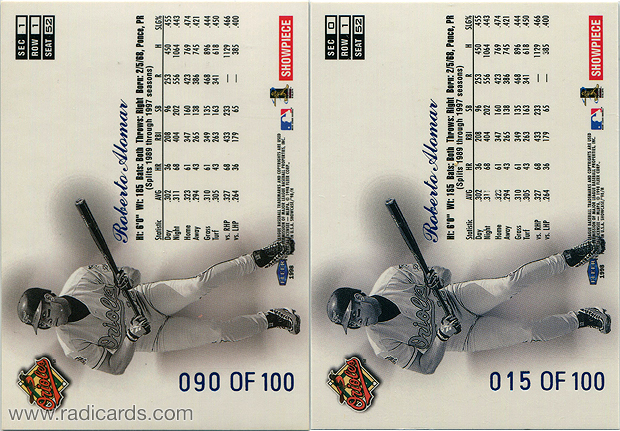 The Alomar shown is the first one I've ever seen on the open market but there's believed to be between 6 and 7 examples of each card in the Row 1 set that feature the combo-color foil text. Left: This is the correct pack issued version. It features the script with the players name above the stats box. The serial number is on the left side of the card and the "of" between the numerator and denominator features an "O" (the letter O) in the word. Right: This is the backdoored aftermarket example. The script with the players name above the stats box is missing. The serial number is printed along the bottom edge of the card and the "of" between the numerator and denominator features a "0" (the number zero) in the word. The following image features a side-by-side back comparison between the intended release and the replacement release of 1998 Flair Showcase Legacy Collection Row 1 parallels. Notice how the back of the replacement version appears identical with the only difference being the SEC number being 0. The replacement card is an authentic piece. You can tell because the "OF" between the numerator and denominator features an "O" (the letter O) in the word and not a "0" (the number zero) as shown on the aftermarket example. I have the Tony Clark Row 0 aftermarket as well. No name on the back and the serial number is directly below the stats, as shown in your Frank Thomas image. It wasn’t mentioned in the listing as such, and at first I was upset but after awhile, I realized it wasn’t worth getting upset over. I’ve noticed that the aftermarket Row 0s aren’t terribly rare but I think they’re still important to the full run of cards available for any one player in the set. Very interesting comments on this Flair Legacy issue. Also to be noted is that the row 0 cards “back-doored” were only cards numbered 1 thru 60 of the 120 card set. I have busted over 300 boxes of this product and have a complete 480 card Legacy set all with factory packed cards with the player name in blue foil on the back. It may be a one-of-a kind! I’m currently working on a second set, about 85% complete. The rarest card in the set is the # 29 Ricky Ledee Row 0 real Legacy. I have only seen 2 in 20 years of working this set including my PSA 10 and 1 that I resold many years ago. I’m always looking for more comments and info on this unique set. The row 1 Purple Legacy cards are super rare and I’m guessing only 5 or 6 of each exist. I have a few including the Jeter Purple Legacy. I only know of 1 other. I’m also holding the Row 0 Masterpiece cards of Bonds, Gwynn, Clemens and a few others that I pulled from packs. This has to be thee most interesting set I have dealt with in 50 years of collecting. Wow, John! That’s incredible information to hear. I can only assume you broke 300 boxes during, or around the time the product came out; sealed boxes in today’s market have proven to be difficult to find. You’ve really accomplished quite the impressive task with completing a full 480-card Legacy set. Really amazing stuff. Thanks for reading. Hello, Just read this. Very interesting information. I am interested in any Biggio cards you may have from this product.- Thanks. Hi, Michael. Thanks for reading; I’m glad you liked it. John, if you have any Biggio cards for sale, my email is [email protected]. Thanks! I’ve recently come across a collection of these cards, numbered to 100 with no name, dull finish on the back. Manning rc’s , moss rc’s , basketball, football. Are these worthless? That’s really nice to hear. There’s certainly value there. Send us a message through our Contact page if you’re looking to sell them; we’d be interested in having a look.